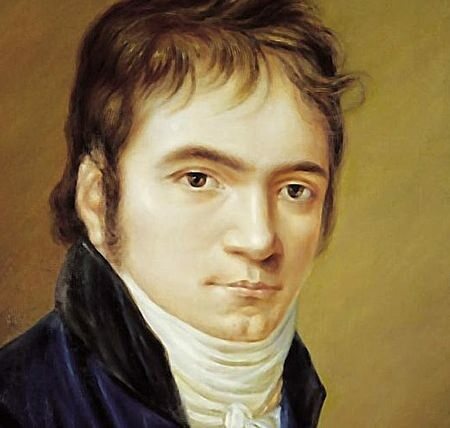 Ludwig van Beethoven in 1803. A few days ago, a friend mentioned that just for the fun of it, he was working on one of the Chopin scherzos. Now I should explain that this is a feat in itself, because you have to be a pianist of professional ability to get your fingers around the notes, let alone make any musical sense of them. I eventually listened to all Chopin’s scherzos and wonderful they are too. But I began wondering about the word itself, which has an interesting background. Like the words pizza and Chianti, you have to use the Italian pronunciation (SHKEHR-tsoh) with a definite roll on the letter “r”. The word is related to the Italian verb scherzare which means to joke, jest or play. It was sometimes used during the late Renaissance and early Baroque to describe a light-hearted piece of music invariably in triple time. Monteverdi wrote his Scherzi Musicali in 1607 and they are charming works for one, two or three voices accompanied by a small instrumental ensemble. A scherzo shows up in J S Bach’s Partita No. 3 in A minor but generally during the Baroque and Classical periods the form was rarely used. Eighteenth century symphonies, chamber works and sonatas invariably included a minuet – usually as the third movement of a work. Its origins lay in the courtly dance of the same name. As the Romantic Movement began to emerge in the nineteenth century there was less interest in form, style and elegance, and more in human expression, emotions and the glories of nature. The thoughts and feelings of the individual were paramount and music needed to reflect that individuality. The graceful minuet was simply no longer appropriate. Although Beethoven included a minuet in his first symphony, it is but a distant cousin of the minuets or Haydn and Mozart. In his second symphony Beethoven ditched the minuet altogether and wrote a boisterous lively movement in triple time – a scherzo. You probably know the work, so perhaps taking the third movement out of context is permissible. When Beethoven began writing this symphony in May 1803, he had already realized that his deafness was incurable and likely to become total. A couple of years earlier, in a confidential letter to his close friends, he admitted that the problem had become so acute that he once contemplated taking his own life. Fortunately his passion for music prevented him from doing so. This thrilling scherzo illustrates how far Beethoven had moved from the minuets of the eighteenth century. The opening theme on the woodwinds is fast and playful with characteristic repeated notes but when the melody is thundered out at 00:39 you can hear that Beethoven really means business: this is no mere dance. Sometimes Beethoven plays with rhythmic ambiguities and occasionally it’s not clear whether the music is in duple or triple time. This of course was exactly Beethoven’s intention and no doubt contributed to the confusion of the audience at the first performance. This was the first major symphony to use three French horns instead of two and they feature prominently in the middle section of the scherzo. This contrasting middle section is a remnant of the older minuet which contained a central section known as a trio. Beethoven probably didn’t realize at the time but he started a trend. Almost all later composers included a scherzo in their symphonies. Chopin wrote four scherzos (or scherzi if you’re fussy about Italian plurals). They are considered by many to be the apex of the genre but they’re far removed from the original connotations of light-heartedness or humour. The third scherzo was written in 1839 on the composer’s visit to the Spanish island of Mallorca. He travelled there with the free and easy Amandine-Aurore-Lucile Dupin, better known by her pseudonym George Sand. They rented a suite of rooms at a privatized Carthusian monastery in the village of Valldemossa which lies among the island’s rugged mountains. Chopin’s upright piano is still there. The scherzo opens with a mysterious introduction which leads into the sprightly and technically challenging main theme with rapid double octaves in both hands. But later there’s a key change into D flat and we hear a remarkably beautiful chorale-like melody interspersed with delicate falling arpeggios, like a magical sprinkling of stardust. The chorale theme returns again later and the work develops in character and dynamic range with flurries of octaves everywhere.